You should aim to speak directly with the owner unless you have a professional 3rd party acting on your behalf. Find the contact details of the owner either via a whois search or, if available, use the contact form on the premium domain website. When making contact it is important to be polite and also straight to the point (don’t write a long winded email). Advise the owner that you are interested in purchasing the domain and ask if it is for sale, also ask for the desired selling price. Reveal as much information about yourself as you like, however, avoid giving the impression that you are very wealthy otherwise the owner may respond with an overwhelming selling price. If the owner asks you the amount you are willing to purchase the domain for, respond by asking for the owner to set the selling price. Avoid suggesting a value first for it might be much larger than the website owner would have initially set, instead, keep pushing (delicately) for the domain owner to suggest a selling price first. Once the owner provides a selling price, begin negotiating. If the selling price proposed by the owner is affordable, you need not worry because, as per the nature of negotiations, the price can only decrease from that point. If, however, the initial selling price is much too high, you would need to convince the owner that they should sell it for a lower price. If the domain is parked and not in use, you might mention that the domain is not providing much value to the owner and that he or she is forced to pay renewal costs for a redundant website. The domain owner might mention that they are receiving an income from the website via affiliate links and Adsense elements – your strategy would then be to prove that your offer is sufficient to cover the income generated by the website (this is a very difficult process). Approximating the income generated by a website is difficult, not only because of the many advertisement revenue variables but because you would then need to convince the web owner that your approximations are correct and their quoted numbers are wrong. A tactic you could use is to find a similar domain (length or word combination) that has recently been sold and then use that selling price as a starting point for negotiations. You could even supply the web owner with proof of this selling price. But how is it possible to find this information? 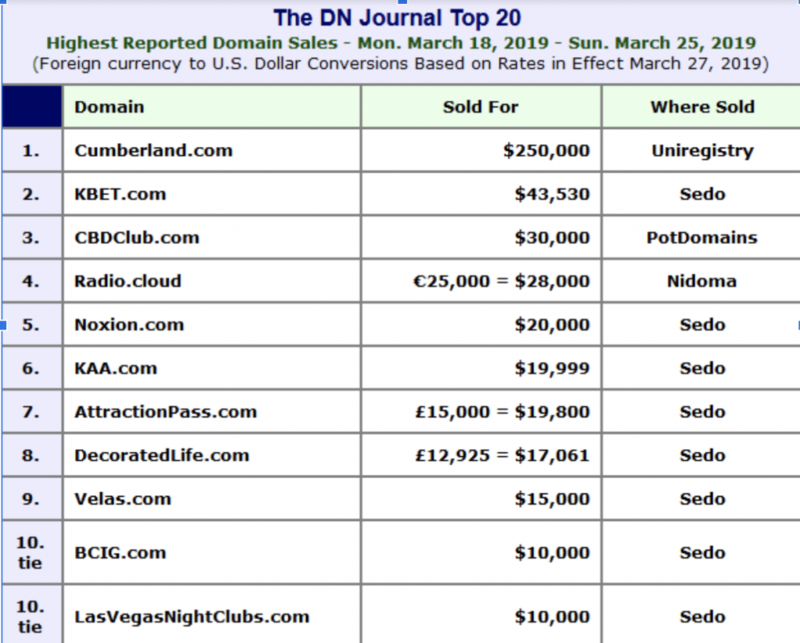 DN Journal generates a domain sales report that is regularly updated. You could search through this list for domain names similar to your desired premium domain and find their corresponding selling prices. Here is an excerpt of their report (notice how you could use the provided selling prices as proof to justify your negotiations). Should You Use An Online Marketplace? Another way to purchase a premium domain is via an online marketplace such as godaddy.com or hover.com. If a premium domain does not have an owner, you can purchase them from these marketplaces at their set pricing. If a premium domain currently does have an owner, you can make an offer to purchase the domain via the marketplace. You may not receive the best offer possible. Making an offer via these marketplaces is very similar to bidding on eBay – its just a mechanical process without any human negotiation elements. Having a professional, skilled in the fine art of sales and negotiations, representing you will increase your chances of purchasing a premium domain at the best price possible. Working with a broker is the safest and most reliable option when purchasing a premium domain. Hiring a domain buy service provider will ensure that your premium domain is purchased in the safest and most effective manner. When contacting a domain owner the greatest risk lies in the transaction process. If you provide your credit card number, they cannot be trusted with it. If the transaction is made via PayPal the owner could offer a link to a faulty PayPal gateway which will deplete your PayPal account. The best possible method is, therefore, an escrow service. With an escrow service the payment of the buyer taken and held securely by a trustworthy third party. Payment is released only when the transaction has successfully taken place. Reputable domain brokers utilize an escrow service for all their sales transactions, so you can rest assured that your payment details will be safe and secure during the entire exchange. Using a domain broker will also ensure that you actually receive the premium domain you are purchasing – there is no guarantee that the domain owner you contact will hand all paperwork and login details over to you after the purchase. The escrow service implemented by domain brokers will ensure that the domain is successfully transferred over to your name – otherwise, the seller will not receive their money! Finally, the main benefit of hiring a domain purchase broker is the fact that they will be exercising elite sales and negotiation skills on your behalf. Domain buy service brokers provide a fair market assessment and accurate valuation of the domain in question – so they will have data-driven evidence to provide domain sellers. And to top it all off, all conversations and negotiations will be performed by the broker, so you will have complete anonymity and protection at all times. Do not let the unavailability of a premium domain prevent you from owning it. Enlist in the helpful services of an experienced and qualified domain purchase broker to ensure a smooth and problem-free transfer of domain ownership.